Today's post is a special one. 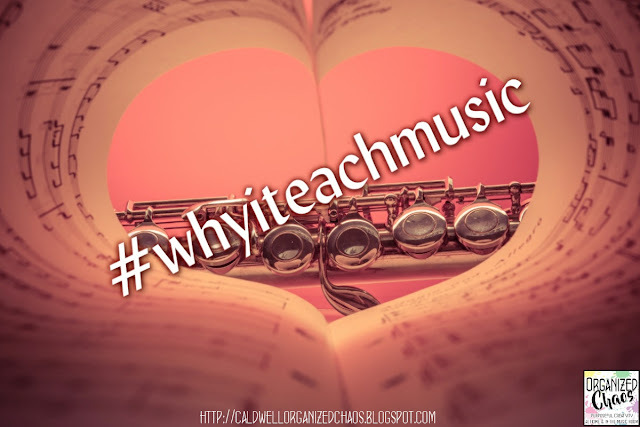 All week long music education bloggers are sharing their stories of #whyiteachmusic to help us all remember, in the midst of what for many of us is a very stressful time, why we do what we do. I hope you enjoy reading my post, and that you'll help to spread some inspiration, encouragement, and positivity by sharing your own thoughts. There's even a giveaway full of items to help lighten your load and bring a smile to your face (so stick around to the end of the post)! When things get tough, it's easy to start wondering why we work so hard to (seemingly) accomplish so little. Colleagues and administrators question the importance of music as a subject or doubt your validity as a "real" teacher, students blow off your class or treat you with disrespect, or you find out that you're supposed to have your kindergarteners ready to perform a concert in two weeks, but they'll be taking a standardized test during the next two music classes (by the way, you're in charge of proctoring the exam so the homeroom teachers can have their planning time)... So let's stop for a minute a breath- let me tell you how I got started as a music teacher. I've said a few times on this blog that I am a teacher first and musician second, and that's true. When I was in high school, I always knew I wanted to be a teacher, but I didn't settle on music until my senior year. That doesn't mean I didn't always know I would keep music in my life. I moved around a lot as a child. When I was in 3rd grade, my family moved (back) to Japan and threw me into the local public school. All I knew how to say was my name and birth date. Long story short, music quickly became my favorite class in those first few months while I struggled to (re-)learn the language. I could communicate, I could participate- I felt I was a member of that classroom community when we made music together. I've never been much of a performer- I cried after pretty much every recital, even in college- but I knew teaching music was my passion when I had my first experience teaching a group of kindergarteners as part of my practicum hours. Seeing their faces as they sang, listened to music, and danced, even those students who didn't speak much English or were timid when I walked in, I was hooked. Remembering the difference my class can make in kids' lives is what keeps me going. I believe strongly in the power of music class to bring all students together into community with each other. 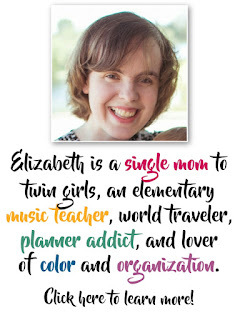 I've seen it happen over and over again: students who feel like they're different or weird, who don't speak English, who are too shy to talk at school, who struggle in every other subject area, come into music class and find their place. Do my students always behave like little angels and leave my class smiling every time? Absolutely not. But just when I start thinking I must be the worst teacher in the world, nobody appreciates the work I do, and my students have all decided they hate music, something happens to remind me that what I do is life-changing for so many students. A few practical things that keep me going too: getting enough sleep, creating a long-range plan ahead of time to make lesson planning easier, staying hydrated, enjoying music outside of school (listening to the radio in the car, playing at my church etc), and sitting down to eat lunch and talk with colleagues. I don't think I fully appreciated the importance of sleep and hydration until I had newborn twins and found out what it's like when you are severely lacking in both. I used to eat lunch in my classroom most of the time while I rushed around checking emails and setting up for my next class, but I've found that taking a few minutes to have an adult conversation and actually eat my food makes a huge difference in my stamina! You can read more about how I do my long-range planning in this blog post (I believe so strongly in the benefits of doing this! ), and I think enjoying music outside of school helps me remember the joy of music, and what I hope my students will learn from me! Music class made a huge difference in my life. It has the power to make students of all walks of life feel safe and included, and gives students with no other voice a chance to express themselves. 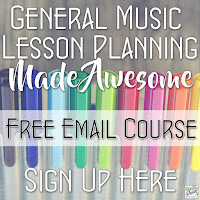 I'm teaming up with some other music education bloggers to spread the love this week, and I'd love for you to join in! I know many of you are stressed right now for a lot of reasons, so we want to encourage music teachers to remember why we do what we do. To sweeten the pot, we're hosting a giveaway too, full of goodies that will make your life easier or bring a smile to your face. Each of us is giving away something different, so there will be plenty of winners! 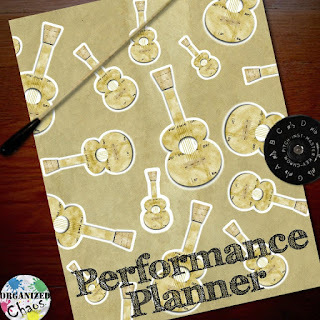 My prize is a copy of my concert and performance planner (if you win and you already own it, you can choose something else of similar value from my store). Having these organizers has made concert season so much less stressful for me, and I hope it makes these next few months a little bit easier for you as well! Click on the picture below if you want to see what it is. Other prizes include a recorder book, a book full of North American hand clapping songs, a music journal, vocal exploration microphones, and so much more! Want more? Subscribe right here to the Organized Chaos newsletter and get ideas and resources for home and school sent straight to your inbox! Beautiful post! I love your comment about how music develops community and brings all students together. It is yet another reason i love music and it will always be in my life. Great post! I love your organizers and use your yearly planner and it is perfect!! Oh, I didn't know you used my planner- mine is seriously my lifeline most days! I loved hearing about your time in Japan and how music became your favorite class! I totally believe in eating lunch with colleagues. It is a great way to get fuel, relax a little and get to know the people you work with. I've known so many music and other specialist teachers who eat alone, or with other specialists, and it makes me sad. It can make such a difference in that feeling of isolation and exclusion within a building when we get to know each other! I love how your really hit the nail on the head with the power of music in children's lives-I believe the same thing and that's what keeps me going! I love how you say you are a teacher first and a musician second. I have always said that I am an educator first and foremost, but that music is the way I reach and teach my students! This is a big year of budget cuts and "prep-providers" feeling less than. Keeping my focus on my classroom and why I teach has really helped! Oh my goodness, I feel your pain! I have never felt so under-appreciated, disrespected, or neglected in my whole career! I always love reading your posts! As far as why? I just love children and music, so this has been a welcome career choice for me! You're sweet! :) And I love your explanation- simple but completely accurate. That's really the core of why (I hope) music teachers do what we do! I really enjoy your posts. It's obvious you LOVE what you do. Most days my job doesn't feel like work. That's because I love being a music teacher. Even in my "off" times, I am always thinking about what else I can do to inspire my students to love music as much as I do.